£10 Off Your Bill with App Downloads at Browns Brasserie and Bar Enjoy £10 off your bill at Browns Brasserie and Bar! £5 Off! Save £2.50 on Your First 2 Browns Takeaway Orders with Deliveroo Check out great deals when you order via Deliveroo! Lunch & Early Evening Menu from £10.95 at Browns Brasserie and Bar Feast for less at Browns Brasserie and Bar. Great prices on lunch and dinner menu's! Gift Cards from £5 at Browns Brasserie and Bar Stuck for a gift idea? If so check out gift cards from Browns from just £5! Afternoon Tea from £15.95 at Browns Brasserie and Bar If afternoon tea is a treat for you, book now at Browns Brasserie and Bar and get a great deal! Free Bottle of Prosecco on Your Birthday with Privilege App Downloads at Browns Brasserie and Bar Become a member of the Browns Priviledge Club, and when you dine on your birthday there'll be a complementary bottle of chilled prosecco for you. Kids Three Course Menu from £9.95 at Browns Brasserie and Bar Available for children up to the age of 10! Kids Two Course Menu from £7.95 at Browns Brasserie and Bar Valid when children up to the age of 10! Browns Brasserie and Bar was first opened in 1973 and people have flocked to the various restaurants, located throughout the UK, to enjoy delicious quality food and drinks in truly unique environments since then. When it comes to great food, Browns has plenty to offer from breakfast or brunch that is sure to get your day off to a good start through to the main menu offering contemporary British brasserie dishes which are sure to satisfy everyone’s tastes. Enjoy a hearty British classic or discover the infamous burgers at a great price when you let vouchercloud help with the bill! Discover the splendour and captivating ambience of Browns with an evening meal complete with live piano music to transport you away from the frenzy of daily life to somewhere much more magical and relaxed. Create a memorable experience during the warmer months with a spot of alfresco dining and watch the world go by from some of the restaurants’ magnificent viewpoints, in particular, the extensive terrace of Browns in Windsor which gives diners a unique view of the Castle. Whether it’s a romantic meal for two or a birthday celebration you’ll never forget, you can rely on Browns Brasserie and Bar to deliver exactly what you’re looking for. How do I use my Browns Brasserie and Bar voucher? Choose the Browns Brasserie and Bar vouchercloud discount that you want to use and click on 'View Deal' to receive your code or voucher (the offer details will tell you if voucher or code is needed). Print out your vouchercloud Browns Brasserie and Bar discount voucher, or save it on your smartphone if you don't have access to a printer. Let them know that you'll be using a discount voucher when you arrive at the restaurant, this will make it easier for them to apply the discount to your meal. Show them the code or give them your voucher when you pay. Sign up to the Browns newsletter and you can enjoy a complementary cocktail on the house plus many more great offers each month. How do I book a table at Browns? The easiest way to book is via the website, click on ‘Book a Table’ and follow the on-screen prompts. Another alternative is to ring the restaurant directly. You can find the relevant telephone number by searching for the required restaurant here. What are the opening times for Browns? The opening times may vary between restaurants. 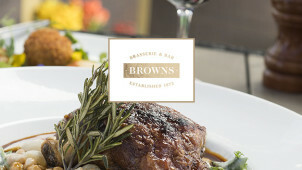 Search for the Browns Brasserie and Bar you are wishing to visit using the ‘Choose Your Browns’ drop down option at the top of the Browns Homepage. The page of your chosen restaurant will have full opening hours and food service times on it. Are there eating options for children at Browns? There is a full children’s menu for diners aged up to 10 years old which includes starters, mains and desserts. Are there sufficient dietary options available on the Browns menu? For detailed allergen information and dietary options please visit the website. Please ensure you refer to this guide prior to each visit to confirm that nothing has changed. You can find the feedback form here, after finding your local restaurant. If you’re looking for an exquisite meal or to enjoy a few drinks in a stylish establishment then look no further than Browns Brasserie and Bar. With venues across the UK, many of which are in beautiful historic buildings, there is no doubt that anyone who visits Browns will have an extraordinary experience. Be part of the lively Browns atmosphere and enjoy a refreshing cocktail amongst the company of friends with no need to worry about getting the first round in if you use the latest Browns vouchers. Whether you’re visiting Browns for afternoon tea after a busy shopping spree or a romantic meal with your partner, the brasserie offers an elegant space to relax in at any time of day. A visit to a Browns Brasserie and Bar could be a step back in time as well as a delicious meal out due to many of the restaurants residing in historic or listed buildings. Browns in Bristol was once a part of the Bristol Museum and Art Gallery and the building itself is modelled on the Doge’s Palace in Venice. The Mayfair restaurant was originally a high-end clothing store called Wells & Co where it is believed that Winston Churchill was once fitted for a suit. Book a meal out at Browns Brasserie and Bar on a Thursday and your visit will coincide with the fresh lobster delivery - choose from a range of lobster dishes including the mouth-watering classic Lobster Thermidor complete with a Champagne twist. If you’re planning on starting the weekend in style then you can take full advantage of a Browns discount code to save on Bubbles at Browns, a showcase of the restaurant’s finest sparkling wines every Friday, all offered at an exclusive price.